The Terrorism Act 2000 defines terrorism in very broad ways, to include simply 'the threat' of 'serious damage to property', in ways 'designed to influence the government' for a 'political cause' anywhere in the world. This broad definition stigmatizes a wide range of legitimate political activity as 'terrorism'. The UK has banned organizations on the basis that their activities in other countries fit the broad definition of terrorism. Reports and speeches from a public meeting in Parliament in October 2009 on the purpose and continuing effects of the Terrorism Act 2000 in proscribing 'terrorist organisations'. In June 2005 Statewatch, CAMPACC and the Human Rights and Social Justice Institute set up the 'Terrorist' list website monitoring proscription, designation and asset freezing. 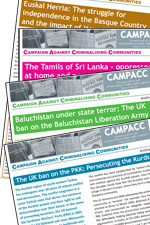 CAMPACC has been campaigning against anti-terror laws being used against Kurdish, Tamil and other communities.